I made a wedding cake! I’ve been promising myself I’d write up the process of making this three-tier wedding cake for Vivian and Julian’s upstate NY half-wedding, so even though it’s been well over a year now, it should still be worth documenting. Find a pretty design and a delicious cake recipe. Make two colors of royal icing: mauve and a deeper purple. Pipe hundreds of tiny little mauve flowers with purple centers in a couple different sizes over a couple of afternoons while watching trashy television. Let dry. Buy foamboard and custom-cut plywood for cakeboards (the plywood gets glued to foamboard for the bottom one). Carefully wrap in foil. Bake seven cakes. Weep in frustration when an entire 12 inch layer cracks and crumbles (hence seven and not six). Wrap cakes and let sit overnight to firm up. Start chocolate ganache for top tier’s frosting, which also has to sit overnight. Level cakes (4 layers per tier) and brush with simple syrup. Start whipping ganache and weep again when it breaks for no good reason. Start over with a simple chocolate frosting. Make an ungodly amount of simple vanilla buttercream frosting. Ditch the idea of tinting it ivory due to the sheer volume. Remind yourself to buy a covered bucket for next time. Fill each tier – dulce de leche for the bottom, strawberry jam for the middle, and chocolate for the top. Carefully construct each tier on its base and crumb-coat. Put each tier into a box and transport all materials to car. Drive car 2 hours to the wedding. Unload everything at the house and put an apron on over the pretty dress you’re wearing because you’re also giving a best-friend speech. Cut straws to size and insert as supports (I like them way better than dowels – easier to cut, less wasted cake, and just as sturdy). Stack cakes, lightly icing each one. Slide parchment paper strips under the edges of the bottom tier to keep the board clean. Don’t bother with a center support. Really ice the whole thing and make it all pretty and swirled. Sigh because the heat and humidity are making the icing slump and not hold stiff peaks. Get over it because it’s dusk anyway. Arrange flowers all over the place. Allow your husband to attach some flowers and roll your eyes slash giggle when he makes straight lines instead of pretty clusters. Pipe their names in extra royal icing on the board. Contemplate learning a prettier ampersand another time. Go give an awesome speech. Hold your breath while others carry the VERY HEAVY cake out to the table. Smile shyly and say thank you hundreds of times while cutting and serving the cake (no caterers). 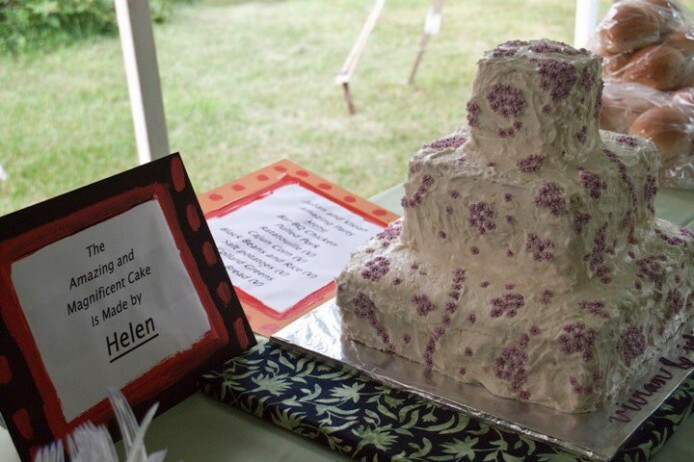 Go home and be glad you did not try to make your own wedding cake the month before. I actually had a TON of fun doing this, but for me it’s definitely a hobby, not a career. Our kitchen was a DISASTER and I don’t even really like sweets to begin with, so I was very much caked-out by the end. The super-awesome cake recipe I used, from a book that is 100% worth buying. The 12-inch and 4-inch tiers required slight adjustments in baking powder. The exact science of leavening can be found in some other cake book, but I cannot remember which. Either one of the Rose Levy Berenbaum ones or the also-awesome Martha Stewart Wedding Cakes book. Preheat oven to 350 degrees Fahrenheit. Coat two 8″ pans with baking spray (the kind with flour). Into the bowl of your mixer, sift together flour, sugar, baking powder and salt. Add butter and ½ cup of the milk. Using the whisk attachment of your mixer, mix together on medium speed until smooth, about 4 minutes. Scrape down sides of bowl as needed. In a separate bowl, mix together the other ½ cup of milk, eggs, egg whites and vanilla. Add egg/milk mixture to flour mixture in three additions, mixing for two minutes after each addition. Scrape sides of bowl after each addition. Divide the batter between prepared pans. Bake 35-40 minutes or until layers spring back when touched in the center. Remove from oven and allow cakes to completely cool in their pans on wire racks. Release sides and bottoms of cakes with metal spatula or knife. Unmold and finish with filling and/or frosting. Does the Ham and Cheese Sandwich cake have to taste like ham and cheese or should we go for some cognitive dissonance and make it a PB&J-flavored cake? Can you imagine how heavy a real Ham and Cheese Sandwich cake would be? HA! I love cognitive dissonance. Let’s make a PB&J cake from SPAM and Olive Loaf. I’m laughing but simultaneously super grossed out from trying to push through the dissonance and imagine it. Yikes! I think Bob Ross liked to work in bacon.